Original Craftsman Chandelier made from solid walnut and ebony wood custom ceiling lighting design. Handcrafted chandelier with genuine fine art stained glass handmade by our expert lead glass masters. This Arts & Crafts chandelier is an original work of art by H.J. Nick, not a reproduction. This made in the same hand and materials as the original Greene & Greene chandeliers. It is designed from the historical record. 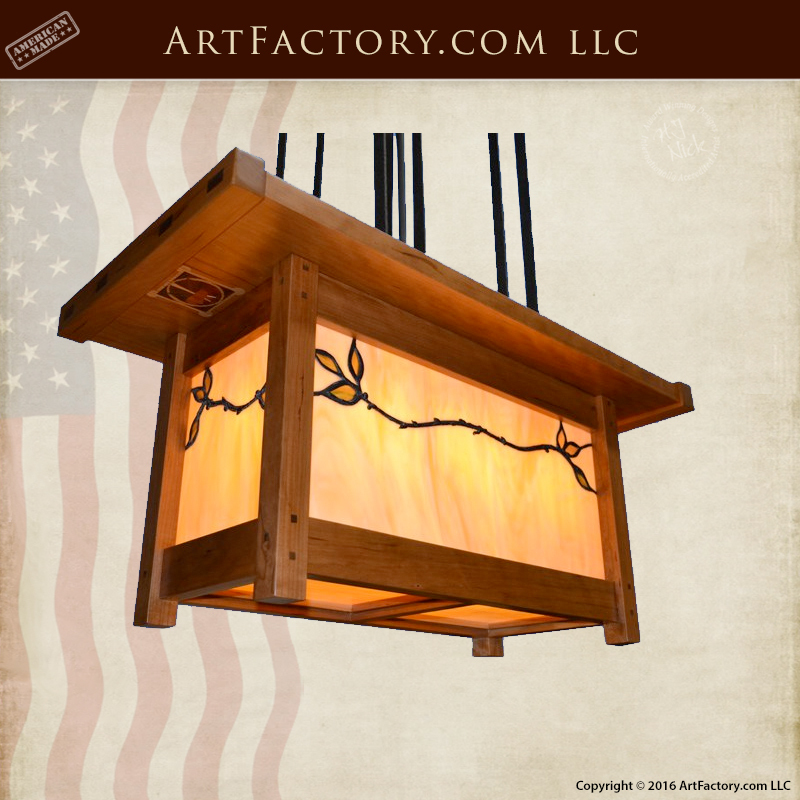 Fine art custom lighting fixtures are built a from solid, full length American hardwood frame that is hand hewn. We construct these frames using mortise and tenon joinery. Additionally, all species of wood are available. Our master craftsmanship ensures that your custom ceiling lights will stand the test of time. We custom create especially for you. Furthermore, nothing from our shop is ever mass produced. We build to true family heirloom and antiquity value. Order your custom lighting fixtures in any style and size. "The light is up and the room painted, it looks fantastic! We couldn't be happier with the quality of the lighting you made, exactly as we specified and one-of-a-kind. Here are a couple of photos.Here are a couple of photos." Hand carved exotic solid old growth woods, along with the perfection of a signature fine art hand rubbed finish, let every one know that this furnishing is something special. Each furnishing is made to order and fits the personality of each client. Some times the hand carvings are copied to the design of other fine art collectables, or it may be art taken from personal photos, coats of arms etc, that have family meaning etc. Don't Be Fooled By Our Upscale Appearance. Our prices are usually lower than lesser quality name brand mass production imports. "We Are The Factory," Hand Crafted In America Since 1913. The Gamble House, also known as David B. Gamble House, (constructed 1908 - 1909) is a National Historic Landmark and museum in Pasadena, California, USA. It was designed by the architectural firm Greene and Greene, brothers Charles Sumner Greene and Henry Mather Greene, as a home for David B. Gamble of the Procter & Gamble company. Originally intended as a winter residence for David and Mary Gamble, the three-story Gamble House is a residential ark commonly described as America's Arts and Crafts masterpiece, whose style shows influence from traditional Japanese aesthetics and a certain California spaciousness born of available land and a permissive climate. Arts-and-Crafts architecture was focused on the use of natural materials, attention to detail, aesthetics, and craftsmanship.